Mimicking the classic style of a country ranch or similar, each Texas rug is a faux hide option for the modern home. 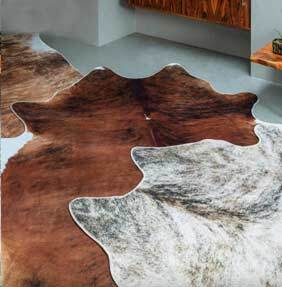 It cleverly incorporates the use of digital photography to print the image of a genuine cowhide onto a regular rug backing. Each of the rugs is cut into a genuine hide shape but they are constructed from 100% super soft polyester, with the digital image printed directly upon them. Unique and a quirky way of adding character to your home, these faux hide rugs provide a talking point as well as warmth and additional texture in your space. They come in a single size measuring approximately 190cm x 240cm and each rug is woven by machine for a consistent finish.